The Spartan Race throws all kinds of curve balls at you, and some things you just don't train for, like crawling a hundred yards underneath taught ropes (or barbed wire) at an incline. 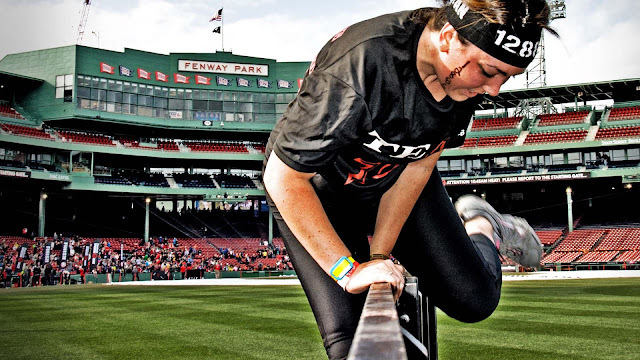 Last year I participated in the Spartan Race sprint at Fenway Park in chilly November (thankfully no water obstacles! ), and it was more challenging than I expected. I'm looking forward to the race again this coming Fall. 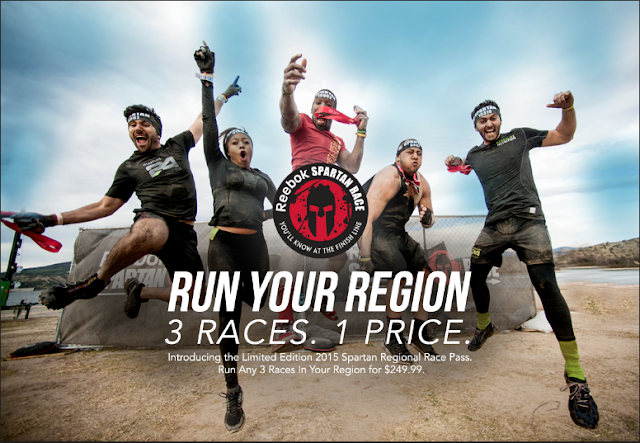 Spartan Race has a handful of ballpark races, and if you're nearby one of 'em, you should consider signing up. It gives you the chance to run throughout the park - even on the field - and it's a rare experience. Brand new is the Summer training guide, which is FREE to check out and download. Mix up your summer work out routine and learn proper form for all of the foundational movements of a Spartan Race. All classic Spartan Race movements are explained and demonstrated by our Spartan SGX coaches in the videos. So check out the guide and get ready to dominate your next race and become one step closer to earning your Trifecta! I've always liked to bike, and as a teenager it was mostly how I got around since I didn't have my own car. I'm not one to accessorize, but I've made an exception for MeasuPro. It's always cool to know how fast you're going or how fast you're doing something. And that's where MeasuPro comes in. Their products are designed to promote everyday convenience offering easily accessible measuring devices. 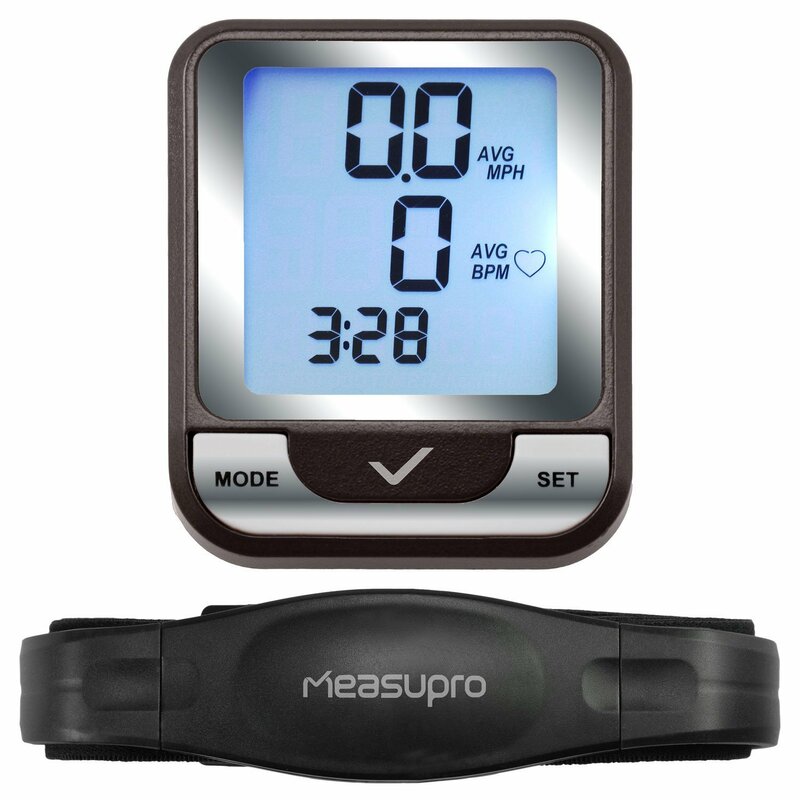 And I recently got my hands on the MeasuPro wireless bicycle computer! 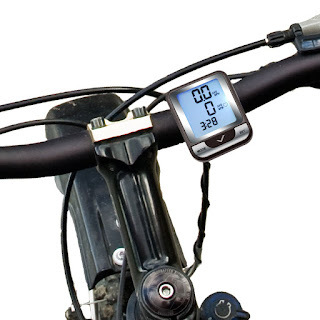 The thought of clocking my speed while on my bike is pretty exciting. Not only does the computer allow me to easily track my performance, but it's also a motivator - how far can I go (odometer)? How fast can I get there (speedometer)? It's fun to give myself goals to reach. MeasuPro also offers unique kitchen tools to empower all chefs out there! They have a store in the Amazon marketplace where you can check out all the products, and they aim to transform the market of household measuring equipment. This computer is relatively easy to set up and includes instructions and everything you need to get it set up. I'm not the best handyman, but installation was easier than I expected. I suppose it helps that I know my way around bike parts. The computer also includes a heart rate monitor which you need to wear around your chest to use it properly. I cannot say I'm a fan or truly need the monitor, however. I don't like wearing it so I don't use this particular feature much. As you'll see above, the computer is not too bulky and mounts on the handlebars via a holder and a couple of ties. Thankfully the computer can detach from the mount to bring with you indoors or wherever. It's water resistant, but I would not recommend exposing it to rain for long periods of time. So who wants to win one of these?! The folks at MeasuPro have been gracious enough to offer up a wireless bicycle computer to one lucky Giveaway Guy reader. Enter to win using the Rafflecopter form below. You may share on Twitter once a day for extra points for the duration of the giveaway. Satisfy your summer sweet tooth! Butterfly Vegan Bakery is back again. In the last blog post with BVB, we ran a giveaway for gluten-free cookies and it was a success. Giveaway Guy readers were interested in the cookies, so we're doing another giveaway for more treats. 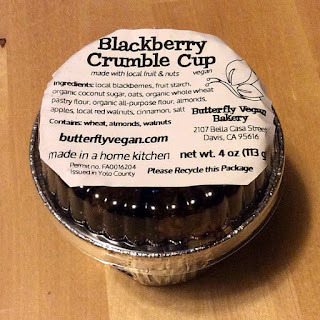 A few days ago I was sent a scrumptious vegan crumble cup from Parvaneh at her Etsy shop, Butterfly Desserts. As she states on her profile, her name means butterfly! She has a passion for eating and making healthy food - especially desserts. Who doesn't like fruit crisp desserts? They're delicious. 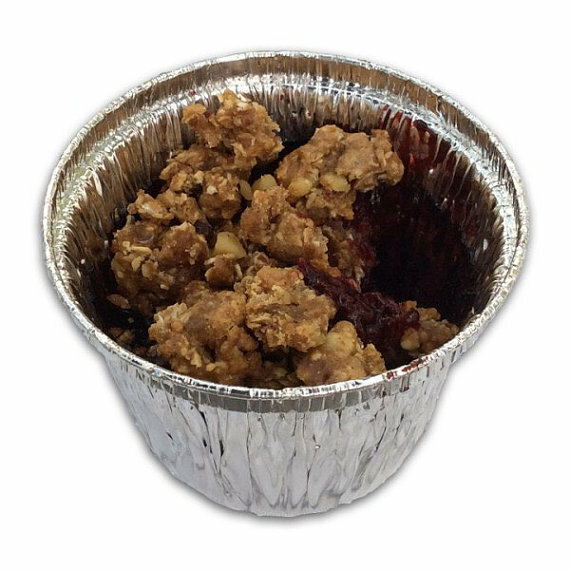 I can polish off one of these crumble cups in just a few ravenous bites! Believe Parvaneh when she says the cups are a market favorite. Enjoy a cup of tart blackberry or peach pie filling topped with sweet crumbles, great as a healthy dessert or summer snack. The blackberry crumble cups in particular are made from blackberries freshly-picked at the Collins Farm in Davis, CA, just a few miles away from the Butterfly Vegan Bakery. 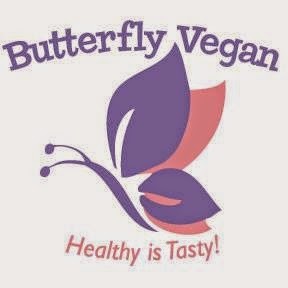 All of Butterfly Desserts' products are made with unrefined sugars like coconut sugar and are SOY FREE. They are also super low-fat and low calorie. All packaging is biodegradable or recyclable. Even the clear bags used for packaging smaller items (like the muffins I previously blogged about) are made with corn starch - not plastic! That's right, the bags are made with corn starch. So who wants to win a dessert?! Parvaneh is graciously offering a vegan crumble cup to one Giveaway Guy reader. You may choose either blackberry or peach. Allergy note: contains wheat, almonds, and walnuts. The fifth season of Game of Thrones has sadly come to an end, but not without drama and attention. I actually have not seen any of this season, but I intend to binge-watch it at some point. The first episode of this season aired April 12th, adapting material from George R. R. Martin's novels A Feast for Crows and A Dance with Dragons. Whether you're a fan of the Starks, Greyjoys, Targaryens, or even the dire wolves, Fencing & Archery has just the shirt for you to show off your loyalty. 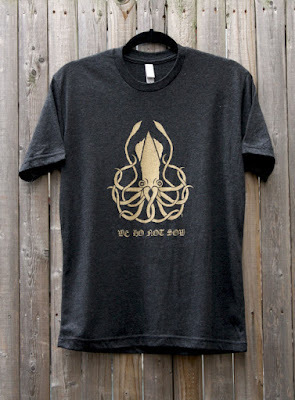 Even though I feel I'm loyal to Robert Baratheon (so long, old friend), I have the House Greyjoy shirt as I also happen to love squids. I mean, look at the design. The shirt is good quality and not made of heavy cotton. You know the shirts I'm talking about - the kind that itch and make you sweat. Not the case here! 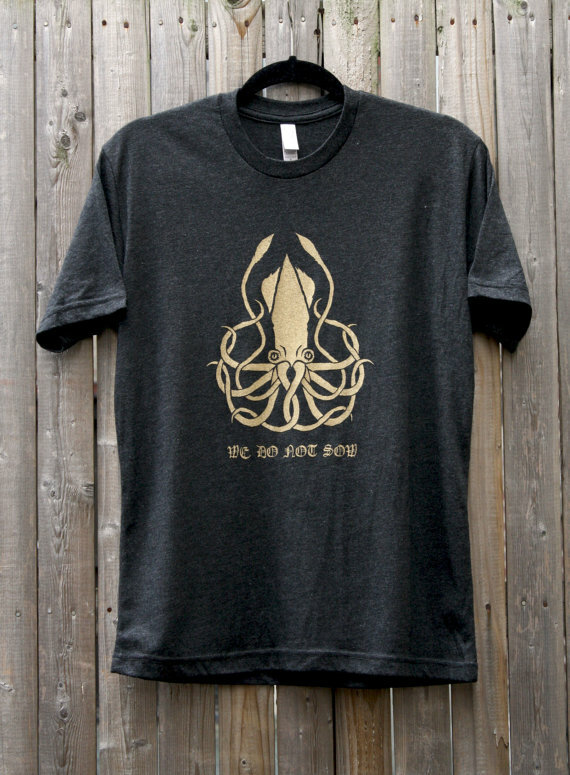 This particular Greyjoy design is hand-printed on a tri-blend preshrunk jersey, 50% polyester, 25% cotton, and 25% rayon. It's pretty soft and comfortable, and very lightweight too. So who wants a t-shirt?! The folks at Fencing & Archery have been gracious enough to offer up ANY t-shirt to one lucky Giveaway Guy reader. With Game of Thrones still a hot topic, now's the time to grab some gear. Happy Father's day! Time for a Father's Day discount courtesy of the folks at Spartan Race! Last year I participated in the Spartan Race sprint at Fenway Park in chilly November, and it was more challenging than I expected. Thankfully I've got five months to train for the next one. So back to that discount! 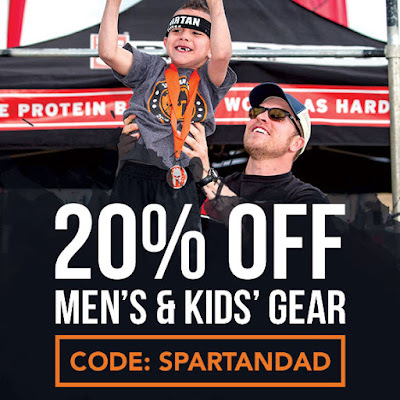 The folks at Spartan Race have been gracious enough to offer a discount code (SPARTANDAD) for 20% off men's and kids' gear. Furthermore, with an adult signup for an upcoming race, you can get a FREE kids race too. 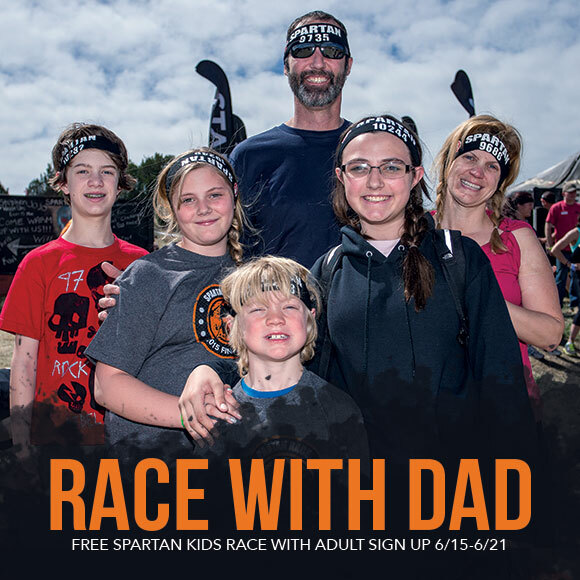 Check out the upcoming Spartan races and sign up. Today (6/21) is the last day to take advantage of the free kid's race! I've reached another milestone - 1,500 followers on Twitter! Thank you to everyone who's visited this blog and decided to follow me. If you've seen my Tweets, then you know I love entering to win things and giving things away. I currently have a bunch of giveaways going on, so check 'em out if you haven't already! They're also listed on the right side of my blog. Golf season is back, baby! I played my first round on Mother's Day and let's just say it wasn't anything to write home about. But the weather is finally nice, so there's that. My clubs had been sitting around for so long that I literally had to dust 'em off. And with golf season back in full swing (see what I did there? ), that means it's time to look at the gear you have and see what needs an update. I wore out my glove from last year, so I picked up a fresh one for my round last month. But I could also use some new golf balls. And I don't mean balls that I find in the woods when I'm searching for my wayward tee shot. Ever heard of Snell Golf? Chances are you haven't, so it's time to become aware. 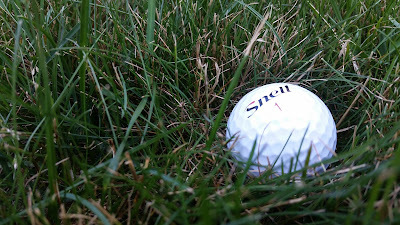 My Snell ball in the rough - where my tee shots like to go! Snell Golf's mission is to offer tour-caliber equipment golfers at an affordable price. Sounds good to me! Their experience in R & D and direct-to-consumer modeling allows them to do just that. They're based right here in my neck of the woods in Massachusetts and I didn't even know it. Pretty cool. Snell golf balls are designed by the one and only Dean Snell. Dean has 25 years of experience working for companies like Titleist and Taylormade, and his name is now on 38 ball patents. That's an incredible number. Have you ever played Titleist Pro V1 or Professional balls? Dean Snell is credited as the inventor. 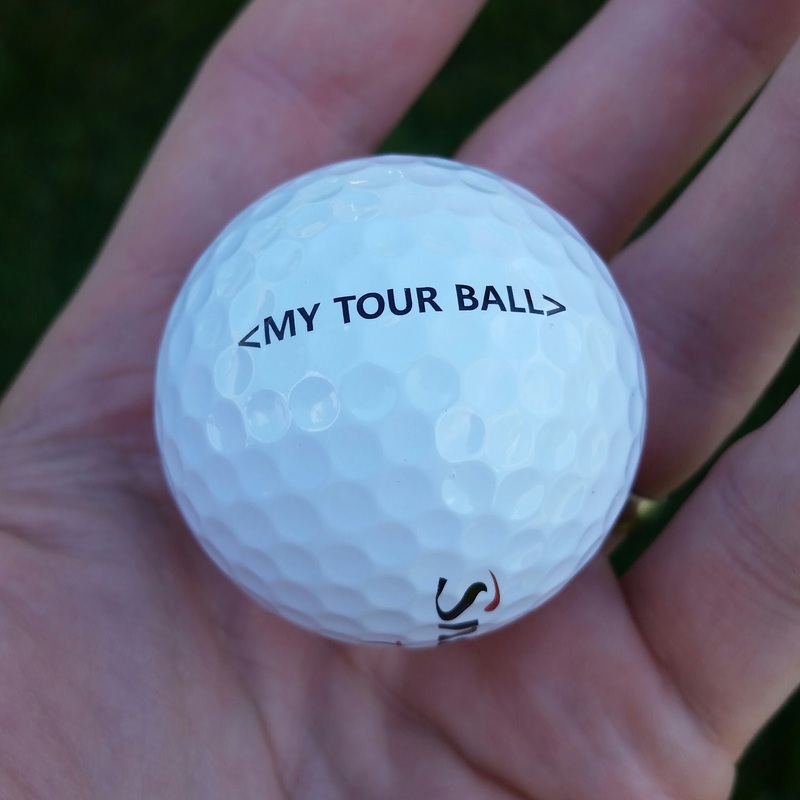 I recently got my hands on a dozen of the My Tour Balls. This ball is Snell's 3-piece, tour-caliber golf ball engineered to provide outstanding tee to green performance, with a mission to improve scores for all skill levels. All levels, you say? That's me! The core has a low compression and soft feel to help with ball speed regardless of swing speed, and creates low driver spin rates for longer distances. The cover, soft and durable, is made of a thermoset cast urethane and allows for better short game spin control. The My Tour balls are nice. I'm afraid to lose 'em, but I like playing with a ball that's designed by the same guy that designed the Pro V1. At some point in their careers, PGA professionals have played balls designed by Dean Snell, so why not try Snell Golf balls? I think you'll be impressed. So who wants to win something?! The folks at Snell Golf are graciously offering two dozen balls to one Giveaway Guy reader - one dozen My Tour Balls and one dozen Get Sum balls. That's a $53 value. In my family, we like to go on walks, sometimes at night. We typically bring small flashlights so we can easily be seen by cars. I'm not a fan of carrying things while I exercise or walk around though. 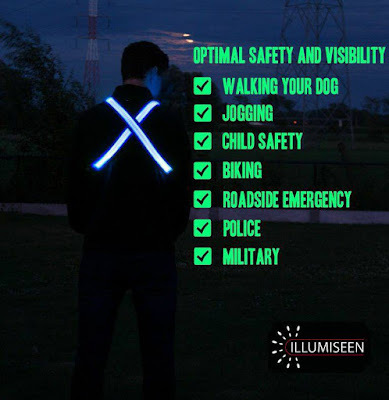 Illumiseen sells innovative LED-based products aimed at delivering safety and value to people near and far. They have a store in the Amazon marketplace where you can check out all the Illumiseen products, and they ensure every effort is made to exceed customer expectations. I recently had the pleasure of getting my hands on the LED reflective safety belt, which is perfect for evening strolls. 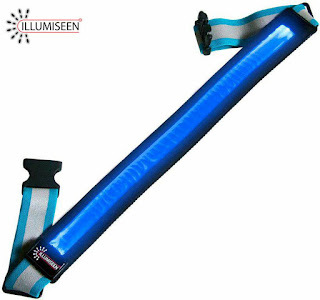 When turned on, this belt is bright! It's impossible to not be seen by cars or whoever else. They'll see you coming for sure. Not only is it great for walking and running, but also biking, and perhaps for those who work outdoors. When the fall comes around it'll get darker earlier, and I plan to wear this belt on my ride home. Oh, and it has a blinking mode too. Again, impossible to not be seen. The guy below is actually wearing two belts, but it shows just how bright they can be. You can strap it over your shoulder, strap it around your waist like a true belt, or tie it to a backpack or something. My wife even suggested this would be a great idea for trick-or-treating. Something I'm thankful for with this belt is that it doesn't use batteries to light up the LED. It's USB rechargeable! I can even plug it into my lap top at work and it charges in just an hour or two. A charge will give you about 36 hours of illumination, which is a lot longer than you'd think. I have the green belt and it's a cool color. It's not a very common color for various types of lights on the roads (aside from traffic lights), so I like to think it stands out more. My wife and I like this safety belt so much that I'm planning to buy a second one in blue. We might even consider an Illumiseen dog leash or collar when we get a dog. So who wants a free belt?! The folks at Illumiseen have been gracious enough to offer up an LED reflective safety belt in blue to one lucky Giveaway Guy reader. Enter to win using the Rafflecopter form below. You may share on Twitter once a day for extra points for the duration of the giveaway. Citrus is back in season! I recently won a Cookeezi lemon and lime squeezer, which is advertised as premium quality. Cookeezi uses 18/10 stainless steel material to make the squeezer. What the heck does that mean? 18 refers to the amount of Chromium and 10 refers to the Nickle content in the stainless steel. You might still be scratching your head like me, but studies have shown 18/10 is the perfect blend to give optimal strength and shine. I've decided to turn around and give the juicer away to a lucky Giveaway Guy reader rather than keep it for myself. The giveaway is available to everyone worldwide. 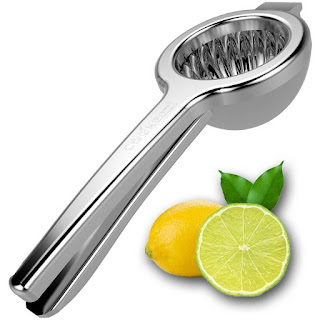 No bending of the handles when squeezing larger lemons and limes. If you like snacks and haven't tried a Larabar yet, you're missing out. They're tasty, gluten-free, and are actually pretty healthy for you. My favorite bar is blueberry muffin. It's real fruity, rich, and just tastes great. You've got blueberries, cashews, dates, lemon, and vanilla. Did you know blueberry is the most popular muffin flavor in the U.S.? People love blueberries. 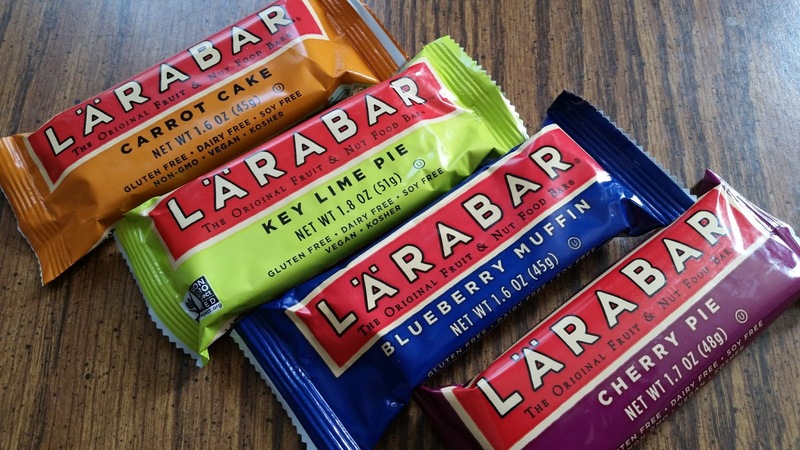 Larabars are great for on the go, at the office when you're in need of a pick-me-up, sending with lunch for your kid, and pretty much anything. The bars are portable and small enough to stick in your pockets too. Several months ago I partnered with Larabar for a variety pack giveaway. Since it was a hit, I've decided to do another one, but on my own. Which one to eat first? That's the question! I grew up loving dinosaurs and of course I saw the Jurassic Park movies. You're not human if you haven't seen the first one at least! It's been a long time since the last Jurassic Park movie, but the wait is over. Jurassic World opens June 12th and you can bet I'll be at the theater. There have been a couple trailers to tease us and you can see the very first trailer below. 22 years after the events of Jurassic Park, Isla Nublar, an island located off Central America's Pacific Coast near Costa Rica, now features a fully functioning dinosaur theme park, Jurassic World. The park's geneticists create a hybrid dinosaur known as Indominus rex to boost visitor attendance. People visiting the island when the hybrid escapes are subsequently caught up in the creature's deadly rampage. 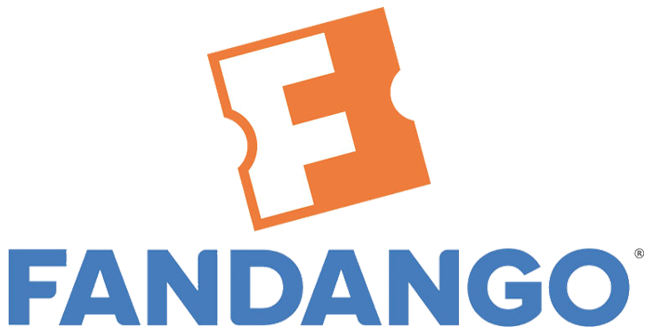 I have a stack of Fandango gift cards that I've won from past giveaways, and I'm going to give away $25 of Fandango credit this month to one lucky reader. What movie are you looking forward to seeing? I currently have a handful of other giveaways going on, so check 'em out if you haven't already! They're also listed on the right side of my blog. My wife recently won a set of Kinivo BTH240 Limited Edition Bluetooth Stereo Headphones (go wife! 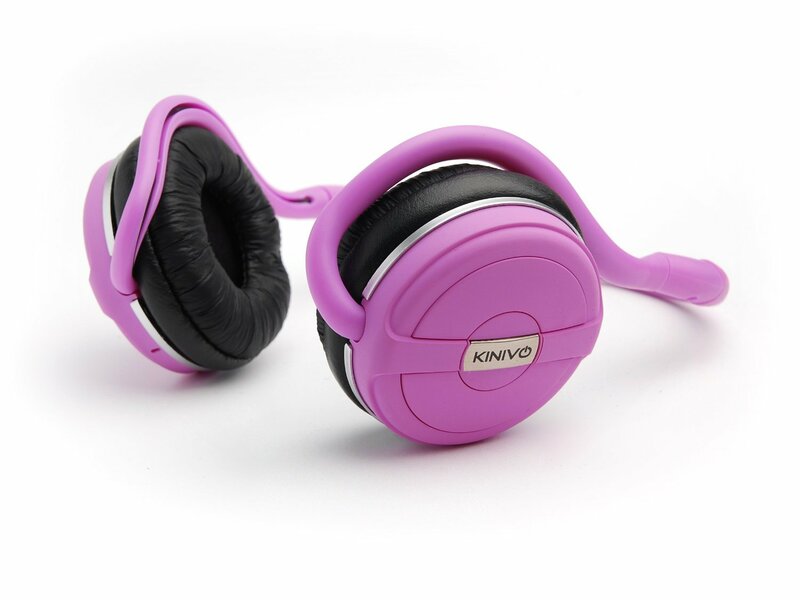 ), and we've decided to turn around and give the headphones away to a lucky reader rather than keep it for ourselves. The giveaway is available to everyone worldwide.